Every four years, the world comes to a halt for one month for the great sporting event that is the World Cup. To take a quote from the great Jim McKay, the World Cup showcases “the thrill of victory and the agony of defeat,” all while bringing to the forefront new stars and giving legends one last swan song before they ride off into the sunset. Unlikely heroes rise and established superstars collapse under pressure. All in all, this event is the embodiment of why sports rock. The beautiful game brings fans from all over the world and unites them in the most unlikely ways possible. From Mexicans rushing to the Korean embassy to thank their heroics that allowed El Tri to advance to the round of 16, to Japanese and Senegalese fans bonding over anime theme songs, we get a greater sense of global unity. Even if the United States didn’t qualify for the World Cup, that doesn’t mean we can pretend to sing along to the national anthem of the country we’re supporting (I mean, have you heard Uruguay’s anthem? It slaps.). For most of the countries participating, the only piece of music that we’ll hear from that country will be their national anthem. There’s a world of amazing music out there that a lot of us haven’t even discovered because of these language barriers. But what if, in the spirit of the World Cup, we wanted to find out what the best album amongst the participating countries? Introducing the World Cup of Music. 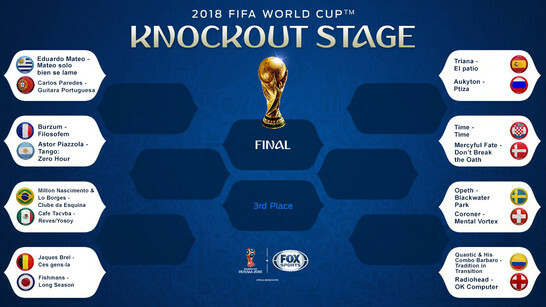 We’ve put the 16 nations participating in the knockout stages of the World Cup against each other again. For some countries, this might be their chance to redeem their national team’s performance in the actual World Cup. We’ve chosen the best album from each country to represent that nation in the World Cup of Music. How did we choose which albums to represent each country? Artists must hail from and be primarily based in the country they are representing in the tournament. Sorry Panda Bear (Portugal) and Charles Mingus (Mexico), you may have ran away with the competition if it weren’t for this rule! Classical music releases are not allowed; two countries, Switzerland and Portugal, had The Nocturnes as their highest ranking album, which would mean listening to the same album twice. All recordings must be studio albums, to ensure a level playing field. Japan’s number one album was Fishmans’ 98.12.28 Otokotachi no Wakare, a live recording. As a result, the second ranked album was chosen to represent Japan (in this case, Fishmans’ Long Season). After accounting for the rules, these are the eight match-ups for the first round of this tournament. The best part is that you have the opportunity to select the best album by voting throughout the tournament. Visit the Google Form at the bottom of of this article to vote for your albums. The first round of voting ends on Monday, July 9 at 11:59 p.m. Following rounds will have a much quicker turnaround. We hope that you discover some new music as a result of the tournament. May the best album win!